Above is a rendition of what Vermont Yankee could look like if it was safe and clean. 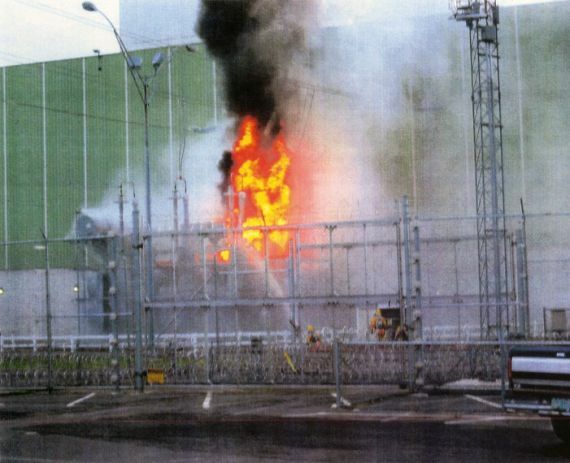 Below is an image of a fire at Vermont Yankee, the current mismanagement is a dangerous and potentially deadly game. We can do better. On a global level sustainable energy choices like wind, solar, and small hydro are already out-pacing nuclear power in energy production. These already proven technologies will provide new jobs, new investment, and clean energy choices for New England. In 2001, Germany started to install 3300MW of solar PV over the course of 4 yrs. Vermont gets 20% more SUN than Germany. Vermont only needs 250MW to replace Entergy Nuclear Vermont Yankee. Think about it.We must act to create a really green energy future. Closure of Vermont Yankee does not mean loss of jobs for the community. If Entergy commits to long term cool down, the skilled workforce could be employed in a thorough clean-up of the site – one that we could all be proud of. The NRC permits decommissioning to take as long as 60 years. That ensures the retention of the present workforce in removal of the contaminated reactor, clean up of the ground water, and monitoring of the high level waste. It would enable the amassing of funds necessary to do a good job. Yankee Rowe, one of the smallest commercial reactors in the country, cost $39 million to build and over $630 million to clean up! Nuclear power is dangerous, dirty, expensive and un-sustainable.